Skiing is one of the most popular vacation and recreation activities in Colorado, and in fact, many people visit to state just to ski. Whether you’re an experienced backcountry skier or intermediate snowboarder looking to ramp up your out of bounds expeditions, Brittany and Frank Konsella have the cred to guide you to the state’s special runs. Both have descended all of the state’s 14ers on skis and Brittany was the second woman to accomplish that feat. They know where the sweet lines are. Backcountry Ski & Snowboard Routes: Colorado―part of the popular series―includes backcountry routes focused on the Front Range and the San Juans, with other routes in the Sawatch Range, Elk Mountains, Mosquito Range, and more. Travel around Colorado with ski mountaineer Dr. Jon Kedrowski as he guides you to some of the best ski descents the state has to offer. Classic Colorado Ski Descents showcases 300 ski descents on 70 separate peak entries on Fourteeners, Thirteeners, as well as easily accessible mountain passes and locales; with routes that range from peaks with gentle terrain, to tree glades, endless powder, ridge lines, steep faces, and couloirs. Each peak description includes skiable vertical, elevation gain, and roundtrip mileage, as well as easy-to-follow directions to the trailhead. Dr. Kedrowski, who brings his expert knowledge from having skied various descents on the 58 Colorado 14,000' peaks brings in a total of 300 different ski lines and ski descents described in detail and notated with 70 color topographic maps in this book, and complete color photographs- a must have for any backcountry skier in Colorado! This guide covers seven major mountain ranges across the Colorado Rockies. Avid skiers have flocked to the northern reaches of the Centennial State for over a century. While the prized powder remains the same, the top skiing destinations bear only a faint resemblance to the resorts of previous generations. Neighborhood slopes, such as Tabernash Hill, featured little more than a rope tow and a storage shed. Other spots like Estes Park's Old Man Mountain held tournaments and contests with Olympic participants. From the Cathy Cisar Winter Playground in Craig to Cheyenne Mountain's Ski Broadmoor and everywhere in between, join authors Caryn and Peter Boddie on a tour through the lost ski areas of northern Colorado and the Front Range. The Army's 10th Mountain Division, developed during World War II for combat missions in the mountains of northern Italy, evolved into ski patrols as we know them today. Far-reaching and nuanced, the job of a ski patroller combines long days, physically demanding work in high alpine environments, and the ability to respond to complex medical emergencies. In Colorado, ski patrol has grown from a volunteer operation to a professional workforce--incorporating advancements in lifesaving techniques, avalanche forecasting, and specialized guest services. Relying heavily on their fellow patrollers, life-long friendships are forged on the mountain and often embellished in legendary tales--many of which are shared within. This 66 page book is the product of Lou Dawson's exploration of Colorado's best backcountry and resort uphill offerings. 30 locations, aerial photos, detailed route descriptions and pertinent information make this atlas-style book an essential tool for your tour. Containing only moderate routes and minimal avalanche terrain, this book is a perfect diving board for those looking to explore backcountry skiing. Published by a company who's mission is knowledge and safety, this guidebook is a must-have for your touring pack. 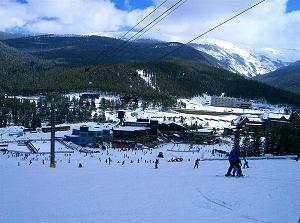 Colorado's central and southern mountains still draw droves of skiers to the slopes. However, many of the historic runs and areas that were popular over the past century -- some near the current resorts of Aspen, Breckenridge, Crested Butte, Purgatory, Telluride and Vail -- no longer exist. Local hills like Whittaker Ranch near Eagle featured little more than a rope tow and warming hut. Now underneath Lake Dillon, Prestrud Jump hosted tournaments where Olympian Anders Haugen broke ski-jumping world records. From Lands End near Grand Junction to Sugarite near Trinidad, from swanky Hoosier Pass in Summit County to Stoner in Montezuma County, authors Caryn and Peter Boddie take readers on a tour of the lost ski areas of central and southern Colorado.